Additive Industries reports that it has officially opened its Process and Application Development Center in Singapore. GKN Powder Metallurgy has formalized its partnership with 3D printer supplier EOS GmbH. GE Additive says that it plans to improve its build preparation workflow with regards to additive manufacturing (AM). 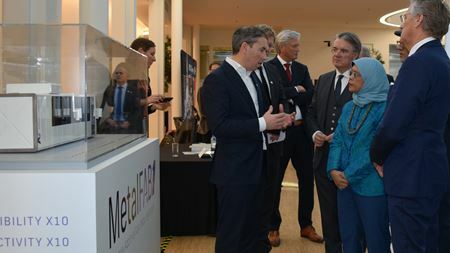 The MPIF reports that the 55th Anniversary of the PM Design Excellence Awards will allow the submission of metal additive manufactured (AM) components. America Makes has given its Distinguished Collaborator Award to Richard J Lonardo, principle consultant at Defense and Energy Systems LLC. 3D printing organization America Makes has formed an MoU with the University of Texas at El Paso (UTEP). Materials specialist Royal DSM has added four additive manufacturing (AM) grades to be used with Digimat-AM simulation software. PostProcess Technologies Inc has formed a strategic partnership to bring automated post-print solutions to Europe. 3D printing company Additive Industries has launched its fifth edition of the Additive World Design for Additive Manufacturing Challenge. Heating company Quintus Technologies reports that one of its hot isostatic presses (HIP) has been installed at a Chinese provider of metal AM technology. Composite 3D printer Thermwood has released a vertical layer printing (VLP) option for its LSAM (large scale additive manufacturing) machines. Marc Saunders, director of global solutions centers at 3D printing company Renishaw, will reportedly be presenting at Formnext 2018. Sandia National Laboratories plans to run a minisymposium covering modeling applications in AM.